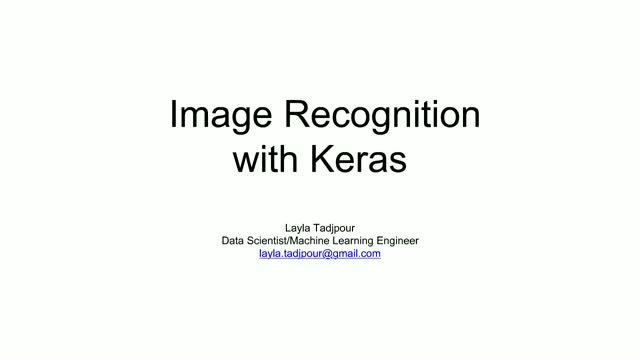 In this webinar, we will learn about image recognition with deep learning. After a brief overview of what deep learning is, and why it matters, we will learn how to classify dogs from cats. That is, how to train a model to recognize dog images from cat images. We use Keras, an easy to use python deep learning library that sits on top of Tensorflow, and “fine-tuning”, a very important skill for any deep learning practitioner, to train a model to classify the images. Once we trained our model to classify dogs from cats images with high accuracy, we dig into the details of the trained model and look at its building blocks, i.e., Convolutional Neural Networks (CNN), Fully Connected Block and activation functions to develop an understanding of how the deep learning model works. Layla Tadjpour, Data Science Consultant, Ph.D. in Electrical Engineering from University of Southern California. Presented by: Layla Tadjpour, Data Science Consultant, Ph.D. in Electrical Engineering from University of Southern California.